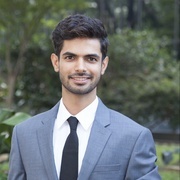 A revolutionary approach to Diabetic Retinopathy "Stage Classification". With 30.3 million diabetic patients worldwide, Diabetic Retinopathy/deterioration of retina (DR) remains the foremost cause of blindness. DR Stage Classification is a manual and time-consuming procedure that needs an expert to evaluate and examine digital fundoscopic images of the retina. By the time experts provide their reviews, the delay leads to a follow-up gap, miscommunication, and late treatment. To tackle this problem, we have devised a revolutionary approach to help doctors detect DR stages in seconds. 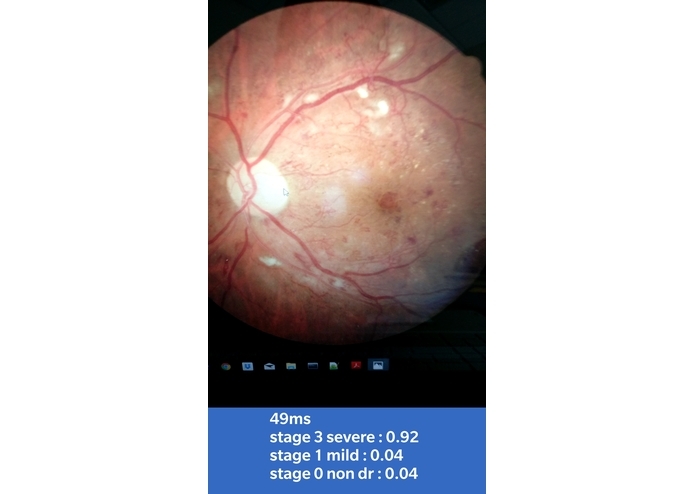 With the help of our mobile app that is equipped with a highly trained Convolutional Neural Network, doctors now can classify Diabetic Retinopathy stages in seconds. Early stage detection will help prevent diabetes in patients. We started with a dataset of 160 images and created augmentation scripts to generate 4000 images. Next, we used a machine learning algorithm to train the CNN and added an additional bottleneck layer to TF Inception Architecture. 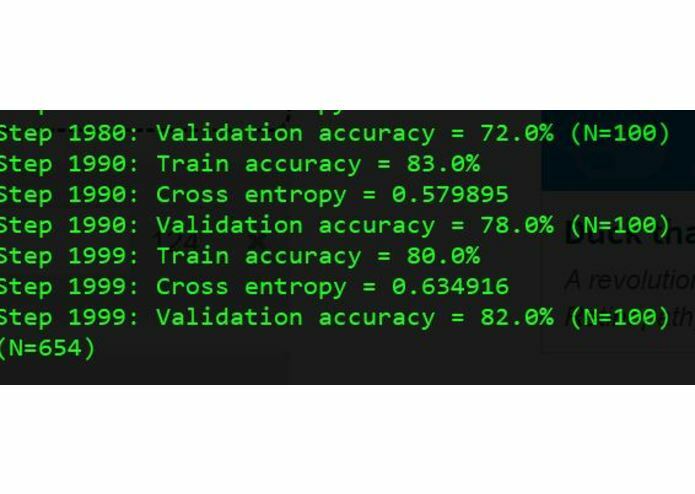 Post that, we applied K-cross validation technique to check accuracy. We tried different sets of data to find out the most efficient combination. Finally, we converted our CNN to an Android readable format and made an app using it. Data Augmentation scripts were difficult to implement as we had to use a lot of different techniques to achieve the desired results. Adding bottleneck was time-consuming and conversion of CNN to an Android readable format was a complicated task. 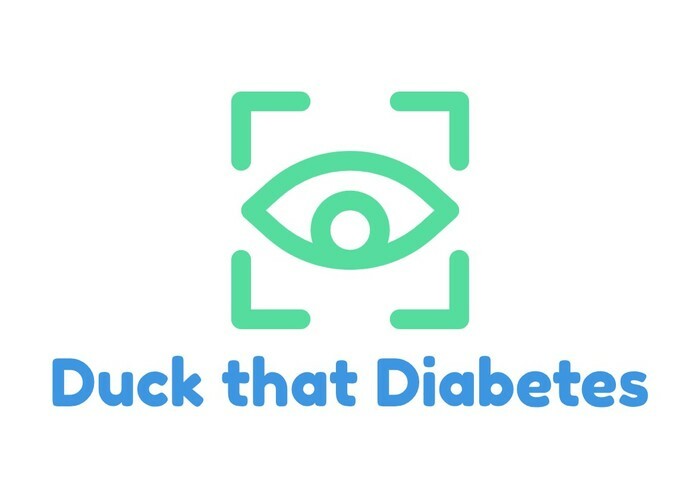 We are proud of being able to make a user friendly DR stage classification mobile app that will assist doctors in helping patients and preventing diabetes. We are also pleased with getting 89-100% accurate results on average. To use Python and TensorFlow for training the Inception CNN. We also learned about various augmentation techniques like rotations, flips, zoom-in-out, contrast, and adding noise. Additionally, we learned about InceptionNet CNN and how to train it. Moreover, converting CNN to an Android readable format was a major learning task. With proper resources and time, we aim to achieve higher accuracy and to promote industry-wide use after a good amount of testing. I mainly worked on training Inception CNN and adding bottleneck layer. 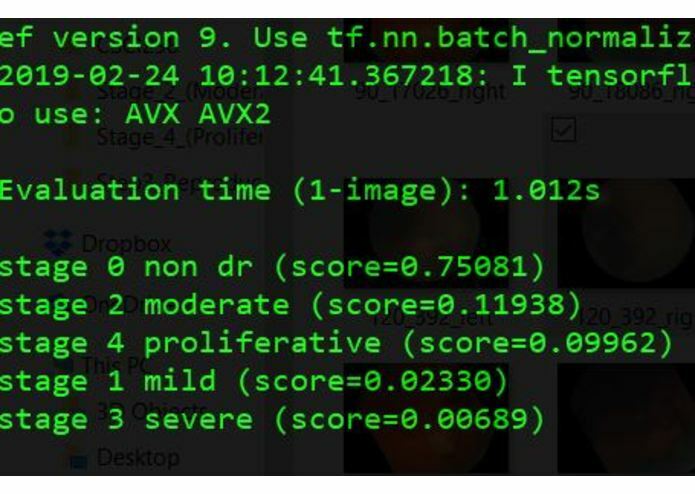 Later , I converted the trained graph in mobile supported format to provide instant DR stage classification results. 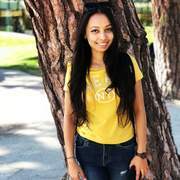 I helped create python scripts and perform data augmentation techniques such as rotations, flips, contrast, zoom-in-out and noise distortions. I also helped in developing the Android app. I produced thousands of augmented images for use in teaching the neural network. This was done using the Augmentor library and my own custom Python scripts.